Do you care if your phone has a replaceable battery? Out of the major smartphone manufacturers, only Samsung and LG seem to have remained loyal to the removable battery concept this flagship season. The HTC One (M8) and Sony Xperia Z2 both sport premium designs, crafted out of metal or glass, but offer unibody sealed chassis that precludes you from swapping the battery. LG G3, on the other hand, as well as the Samsung Galaxy S5, stick with fancy plastic solutions, but you can easily replace their units at will, and the S5 managed to be water-resistant, too, despite the removable back cover. LG's G2 flagship from last year had a sealed juicer, at least in its international reincarnation, but with the G3 the company is back to providing a more flexible design, while Samsung has never betrayed this concept, ever since the Galaxy S line inception. The Xperia Z2, however, sports a stellar battery endurance, almost as good as the Galaxy S5, while the One (M8) also provides battery life that is much above the average in our battery test. Having access to the battery compartment of your phone means that you can carry a spare or two with you when you know you will be away from a charger for a while. Also, it might be helpful if your phone freezes to the extent that only taking out the battery might help, though these cases are rare. Last but not least, a removable back cover and replaceable battery usually means that third party companies can issue extended battery solutions which add less bulk than a charging case, or they might offer rear covers made of a more premium material. That's why we wanted to ask you if you care about a replaceable battery in your smartphone that you can swap on the go, or if you are fine with a sealed battery compartment, as long as the battery life of the handset is in the acceptable range, like in the current crop of flagships. Checkmark your preference in the poll below, and tell us your argumentation in the comments. 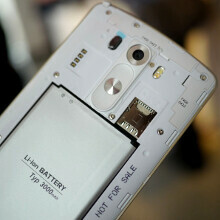 Do you care if your phone has a replaceable battery or not ? oh yes I care. removable battery and micro-SD slot. no need to make excuses about these. LOL How do you know? Just because all apple's armys here and all tech sites, pretend to be "android users" or "disappointed samsung fans", couldn't make those polls valid. Please show us some evidence to back up your claim that Samsung owners are banned from voting on that poll. Some of you ppl amaze me with your completely illogical conspiracy theories. Do you seriously have to include your immature hate of Apple in every post you make? Why would you ever bother with a phone that doesn't have a replaceable battery. Any serious business professional or power user these days needs their smart phone at their finger tips, not tied to a wall some were. Just buy a phone which lasts dude. Yes I care too. The problem is batteries degrade and lose there capacity over time. Why should I pay x company $$$ to have a replacement when it should only cost about 1/10th. Also when it comes to selling your phone, your buyer is screwed sooner or later. I also prefer not to help the NSA. I can take a non removable battery but not no SD card. The RAZR showed me a non removable battery is fine, the Moto G showed me I have to have an sd card slot. Chuuch! I went from the RAZR Maxx to the DROID Maxx. I loved all of the improvements from the former to that latter but no SD card support caused me to get the Note 3 instead. I really miss Motorola's UI but until they add SD slots again I'm good with the Note 3 unitl I see the G3 or Note 4.
yeah it would be better if all the phones'd a replaceable battery. But if 1 day usage is enough i don't mind that much a replaceable battery. And yes for some extreme conditions a replaceable battery would be great definitely. It's currently 50 50 on the poll. I voted no. Previously, i used a spare battery for everything on my galaxy device. Since owning my G2, i've realised that they produced such an awesome battery that lasted really long and charged REALLY fast that carrying a spare meant putting it in in the late evening, which didn't make sense. I have the Samsung Galax Note 3 with the 3200mA battery so I already have one of the best and largest batteries in the market today, but it is still not enough as I use my smartphone all day long for voice, email, texting, internet research, internet radio, video, etc. (which is something easy to do with a 5.7" screen) and many engineering and business applications. It last 24 - 36 hrs with heavy use and 36 - 48hrs light use. If you travel on planes and in airports at all, having a replaceable battery is essential to staying productive. When I simply change out my battery and keep going with work in the airport it never fails that 1-3 iphone users come up and ask what type of phone I am using. Even as an Engineering student in collage I'm not sure how you could survive without a replaceable battery. I guess if your in high school student, liberal arts major or education major you don't need your smartphone so much. Also having two or three batteries keeps them performing at their best and lasting longer as they are rotated at the end of each use. We have several 5S's, a 5C and other iPhones on a family share plan and all of them complain about plugging in while I just swap and keep going. With the Samsung charger and 2A plug it can charge the 3200mA battery in about 2:30hrs. Replaceable battery is a must. As amazing, informative and accurate as your post is, many people ignore logic. It does make perfect sense to keep a key component readily available for quick access and replacement. I've been fighting for this logic to be seriously evaluated through local government and manufacturers for almost a year now. HTC failed to listen and their lack of sales have proven it. LG is starting to realize that there may be relevancy to removable batteries and sd cards after all. Samsung has proven the effectiveness of retaining this choice. Yes Dude2, as an engineering student, your logic plays out just as other engineers have stated yet the people that fall for pretty, shiny phones feel they know better. In fact, they know not what many symptoms resemble device failures are actually just faulty or failed batteries. John B.
I can have an external battery pack anyways, so not important to me. Well Z2 has a reset button for that horrible freeze situation. Only the most retarded phones would not have a seperate logic for the power button to cut the power when held in. Exactly. When my phone freeze, I have to take out the battery to power cycle it. Battery capacity dosen't matter to me, as long as it last full day. But, removable battery makes the different when your phone freeze. Yep. On my old Nokia I had 2 batteries but never used the second one. Just simply didn't need it. Yeah. It won't fully drain before you get home. Though it is possible to drain it night if I really use it a LOT. This. All day. That's wassup!